Sleep is a state marked by a lowered level of consciousness, decreased movement of the body's muscles, and slowing of metabolism. While it might sound like the title of a new science fiction movie, this phrase actually describes the typical experience of most people who live to the age of 75. The fact that people spend about one-third of their lives asleep (roughly eight hours out of every twenty-four-hour day) suggests that sleep is very important to how their brains and bodies function. The desire for sleep is strong. People may be able to deny themselves food or water for a few days, but they cannot go without sleep. Research has shown that severely sleep-deprived people become very uncomfortable and anxious and may even start to hallucinate * . This explains why prisoners-of-war sometimes are forced by their captors to stay awake for long periods of time: the captors know that prisoners are likely to become so desperate for sleep that they will eventually break down and share important information. Researchers have not been able to precisely explain the function that sleep serves. At one time it was thought that sleep provided a time for the brain to rest, but studies have shown that the brain's neurons, or nerve cells, are just as active during sleep as when a person is awake. Some neurons are even more active during sleep. Another theory about the function of sleep is that sleep is essential for the proper storage of long-term memories by the brain. A study by researchers at Harvard University found that performance of a newly learned task actually improves after a good night's sleep. Yet another theory is based on the observation that the brain makes proteins at a much faster rate when people are asleep than when they are awake. These proteins are necessary for maintaining the structure and function of neurons, so it may be that sleep gives the brain the chance to replenish its store of these important substances. This would explain why people report feeling "burnt out" when they are not getting enough sleep; the brain literally may be burning through its proteins faster than it can replace them. * metabolism (me-TAB-o-liz-um) includes the chemical processes in the body that convert foods into the energy needed for body functions. * hallucinate (huh-LOO-sin-ate) means to hear, see, or otherwise sense things that are not real. While researchers are still trying to figure out why people need to sleep, they have learned a great deal about what happens during the sleep process itself. Research shows that the brain makes proteins essential for neuron function at a faster rate during sleep than during waking hours. But close to half of all teens do not get as much sleep as they need, leading to feelings of "burn out," possibly because the brain is burning through proteins faster than it can replace them. Throughout the nervous system, neurons communicate with each other in a language that is both chemical and electrical. Researchers can use specialized equipment to measure the waves of electricity generated by the hundreds of thousands of brain cells. This test, which is called electroencephalography (eh-lek-tro-en-sef-uh-LAH-gruh-fee), or EEG, involves placing electrodes on the scalp and attaching them to a machine that amplifies the electrical changes that are occurring. A special recording pen then translates these changes onto paper, generating waves of various sizes. The appearance of the EEG changes according to whether a person is excited or anxious, calm or relaxed. For instance, when a person is relaxed, the brain generates what are known as alpha waves from the back of the head. People can actually learn how to generate alpha waves by thinking calm, soothing thoughts and entering a state of total relaxation. Instead of cramming all night for the weekly math quiz, a person might be better off practicing the new concepts until bedtime and then getting a good night's sleep. A team of researchers at Harvard University found that college students who got a full night's sleep after they learned a new task were much more likely to improve their performance on the task the next day than those who did not get enough sleep. The researchers taught the students to spot visual targets on a computer screen and to press a button as soon as they were certain they had seen one. With about an hour of practice, students were able to perform the task well. When retested later that same day, the students showed no improvement over their best times. When tested the next day, students who had slept six hours or less showed no improvement. Other students who slept more than six hours performed better than their best times from the previous day. Did the extra sleep really make the difference? In another study with a different group of students, the researchers allowed half of the students to sleep at the end of the day but kept the other half awake until the next night. Then both groups were allowed to sleep on the second and third nights. On the fourth day, both groups were tested. The researchers found that the students who slept the first night performed better than the students who did not, even though the others had two nights of catch-up sleep. This finding seems to provide even more evidence that sleep plays a key role in helping the brain absorb and retain new material. Thanks to sleep studies using EEG, researchers have been able to identify four stages of sleep that are distinguished by different wave patterns recorded from the brain: stage four is the deepest, and stage one is the shallowest. Within forty-five minutes of falling asleep, most people descend very rapidly to level four, which is marked by larger, slower brain waves on the EEG. Heart rate and blood pressure decrease, the muscles relax, and it is very difficult to awaken the sleeper. Throughout the night, the person surfaces from level four to levels three, two, and one (progressively shallower states of sleep in which the brain waves get smaller and faster) and then back down to level four again. 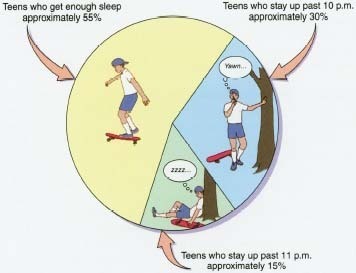 This cycle happens several times during the night. During the shallow sleep stages, people enter into yet another stage of sleep known as Rapid Eye Movement, or REM. This is when dreaming occurs. The eyes move rapidly behind the closed eyelids, and the person's muscles become very rigid. In addition to moving through the four non-REM sleep stages, people can experience as many as four or five periods of REM sleep per night; in general, younger people spend more time in REM sleep than do older people. Because dreams are quickly forgotten after moving out of the REM phase, most people probably dream much more than they think they do. Ordinarily, a person will only remember the dreams that he or she had during the REM phase that occurred just before waking. Research studies have shown that all mammals, not just humans, experience REM sleep, and that the brain knows the difference between this stage and the non-REM stages. Sleep studies have been done in which people are persistently awakened before they can enter REM sleep. After this goes on for a few nights, the people are allowed to sleep normally. Measurements show that they tend to spend more time in REM sleep on successive nights than they usually would. In a sense, the brain seems to be making up for lost REM-sleep time. This holds true for the deep sleep stages (non-REM stages three and four) as well; if people are deprived of these stages, they will spend more time in them on successive nights. 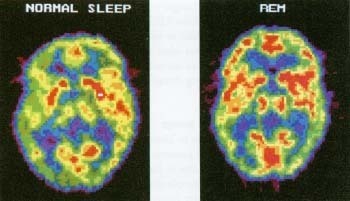 The red regions of these PET scans show the difference in brain activity during normal sleep (lft) and REM sleep (right). During REM sleep dreams occur, and the brain strengthens memories by processing experiences and new information. The PET scan of the REM brain actually looks similar to a PET scan of a brain that is fully awake. What Makes a Person Fall Asleep? There are a variety of physical, psychological, and environmental factors involved in the sleep process. Levels of alertness in the brain are controlled by different groups of chemical neurotransmitters * in certain areas of the lower portions of the brain. Levels of these chemicals vary at different times of the day and as emotions change. The lower portions of the brain communicate with the higher portion of the brain, the cortex * , signaling it to increase its activity or to slow down. Slow-down signals come just before bedtime or at certain other times of the day; many students can relate to feeling sleepy during an early afternoon lecture. However, the cortex has some say in the matter as well. People who are nervous or under stress often have trouble falling asleep because they cannot stop thinking about what is bothering them. And the tired student can force herself to stay awake if she knows the lecture is important. In other words, the brain's cortex can override the signal to fall asleep. Another chemical substance, a hormone * called melatonin (mel-uh-TOE-nin), also seems to play a role in producing sleep. 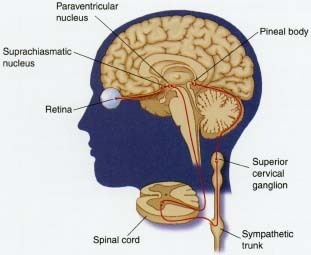 Melatonin is released into the bloodstream by a tiny gland located in the center of the brain. The amount of melatonin in the blood fluctuates widely over the course of a twenty-four-hour period, with levels being up to ten times greater at night than during the day. People also have a main "biological clock" that is located within the area in the center of the brain known as the hypothalamus * . This area receives direct input from the eye, responding to the light changes of day and night and keeping the body on a twenty-four-hour cycle. This cycle, also referred to as the circadian (sir-KAY-dee-un) rhythm, involves predictable changes in body temperature, heart rate and blood pressure, sleepiness and wakefulness, and other functions. For example, body temperature drops to its lowest point between 2 A.M. and 5 P.M. and reaches its highest point in the afternoon or evening. * neurotransmitters (NUR-o-tranz-mit-erz) are brain chemicals that let brain cells communicate with each other and therefore allow the brain to function normally. * cortex (KOR-teks) is the part of the brain that controls conscious thought. It is where people experience conscious, subjective feelings. * hormones are chemicals that are produced by different glands in the body. A hormone is like the body's ambassador: it is created in one place but is sent through the body to have specific effects on other parts of the body. * hypothalamus (hy-po-THAL-uh-mus) is a brain structure located deep within the brain that plays a part In regulating automatic body functions such as heart rate, blood pressure, temperature, respiration, and the release of hormones. The cues of light and dark help to keep a person's sleep patterns and other bodily rhythms on track. However, studies have shown that when a person is deprived of light, his or her body resets its internal clock to a twenty-five-hour schedule. People who have taken part in such studies—living in darkness for weeks at a time—tend to underestimate the amount of time they spent living without the normal cues of day and night. Clearly, then, our environments have some effect on the patterns on sleep and wakefulness that structure our lives. Researchers believe that the body's daily "clock," also called its circadian rhythm, is linked to the pineal gland and to the suprachiasmatic nucleus region of the hypothalamus. These structures within the brain receive information from the eye's retina about daylight and darkness, and send signals about regulating body responses to the spinal cord and elsewhere in the nervous system. * night terrors occur during deep (stage 4) sleep, usually within an hour after a person goes to bed. People experiencing night terrors may sit up in bed, scream, cry, sweat, and appear to be extremely frightened, but they are still asleep and are unaware of their environment. Night terrors most commonly affect young children, although anyone can experience them. Insomnia (in-SOM-nee-uh) is the best-known sleep disorder. It means simply that a person has trouble falling asleep. Just about everyone experiences insomnia at some point in their lives, but for some people this is a condition that persists night after night. Parasomnias (par-uh-SOM-nee-uhs) are a wide range of disruptive sleep-related events, such as sleep walking, sleep talking, eating while asleep, or night terrors * . Often the person is completely unaware of what he or she is doing during these episodes. Periodic limb movement disorder is a condition in which people repeatedly twitch or jerk their limbs in their sleep. Restless leg syndrome is a condition in which people feel uncomfortable sensations in their legs prior to falling asleep. People with this condition often feel the irresistible urge to move their legs; they may also experience cramping, burning, pain, or a creeping or crawling sensation. Sleep apnea (AP-nee-uh) involves having trouble breathing while asleep; the sleeper might snore loudly or sound as if he or she is gasping for air. Physicians who specialize in sleep medicine are trained to diagnose and treat these and other sleep problems. Typically, patients need to discuss their symptoms with the doctor and undergo overnight testing in a sleep lab. A combination of medications and behavioral therapy can usually help. American Academy of Sleep Medicine, 6301 Bandel Road NW, Suite 101, Rochester, MN 55901.